In September 2014, Bisazza, a popular brand for luxury glass tile mosaics, launched a new cement tile collection. Going parallel with the new trends of reviving traditional floor patterns and colors, they crafted several collections and collaborated with famous designers to come up with a spectacular collection. During iSaloni, they added to the collection a line designed by India Mahdavi. The original collection included designs by non other than Paola Navone , Jaime Hayon, & Carlo Da Bianco. You might opt for a simple sofa or sectional for your space for the sake of being convenient or because it is the major part of the room. When it comes to armchairs or loungers, I prefer to go for statement pieces whether in terms of overall design, color, finish, or simply because it is designed by a well known designer. In 2013 many designers presented magnificent pieces which I fell in love with such as the above armchair designed by Jaime Hayon for the Republic of Fritz Hansen. This specific photo made me love pastels, the whole chair is just a delight to look at. the fact that it feels like someone is already seated in it, gives the impression of comfort. A designer who hasn't been in the spotlight for her interior works because this is her first is non other than Nika Zupanc who is well known for her product designs never the less for top brands such as Moroso and Moooi. I found out about her work back in 2010 when I posted about her feminine range of furniture. The first think that attracted me in this project was the beautiful chair, I know it's not a new design but something about it reminds me of the elegance of the Harry Bertoia chair but with a more updated twist to the legs since it was designed in 2010 by Jaime Hayon for Magis. The cherry pendants were designed by Nika herself in 2009. The other details however, such as the sinks, were custom made for this project. I am not usually a fan of strong colors such as black and red together, but here they work magically together. 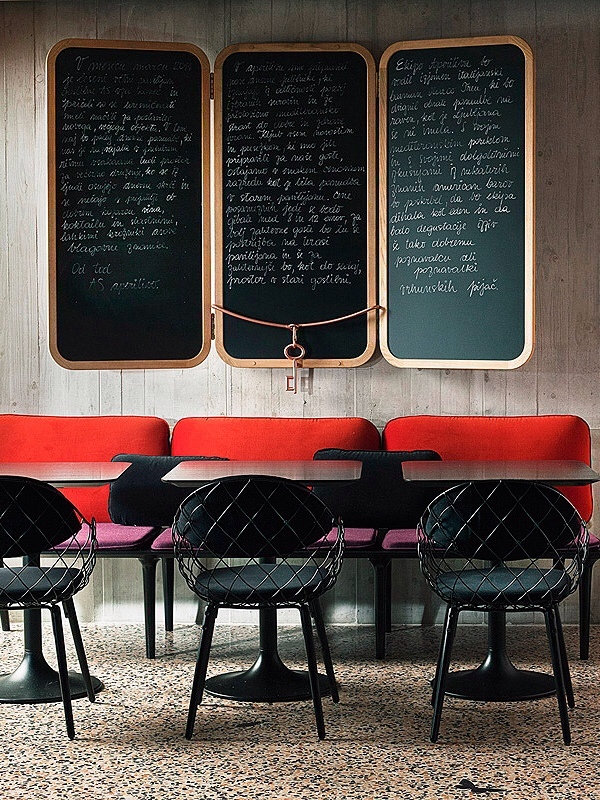 The rippling feminine details of the furniture are mellowed down by the strong black and red. This project is just beautiful. Enjoy the photos and details below.